Pizza at the Mt. Blue Campus cafeteria. FARMINGTON - Between preparing healthy food, adhering to strict nutrition standards, navigating student food allergies, and offering service with a smile, school nutrition professionals have a lot on their plates. School districts all over Maine, while operating within very tight budgets, are working hard to include as much locally grown foods as possible into their menus. RSU 9 School Nutrition Director Andy Hutchins, worked closely with local pizza dough manufacturer “It’ll Be Pizza” in Scarborough and foodservice specialist Lee Walker from Sysco, to create a pizza dough recipe that meets the expectations of today’s students while meeting the USDA’s nutritional requirements for school nutrition programs. Not only did Hutchins work with It’ll Be Pizza to develop this dough specifically for use at RSU 9, but the dough will also be sold through the district’s regular food distributor, enabling the opportunity for expansion to other districts in the future. 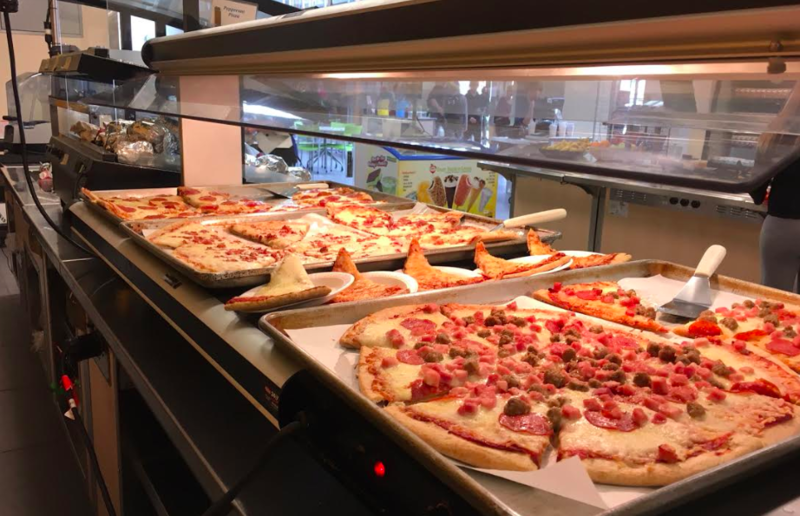 RSU 9 will be the first school district in Maine to offer this healthy and local pizza option to its students, with hope for growth throughout Maine schools in the future. All RSU 9 school cafeterias participate in the Let’s Go! 5210 program and carry out a Smarter Lunchroom model where the healthy choice is made the easy choice. With the addition of this locally sourced whole grain pizza dough option, RSU 9 cafeterias continue to carry out this model. Hutchins is also a strong component of the RSU 9 Farm to School Workgroup and continues to find new opportunities and ideas in exposing students to local foods and farms. To learn more about the Let’s Go! model carried out in Maine school cafeterias, including RSU 9 cafeterias, view the following short video: https://www.youtube.com/watch?time_continue=11&v=DgjMJvsegns. This is AMAZING!! Thanks to everyone who participated in making this happen! Keep it local! Mr. Hutchins..any chance Sandy River Farms could be your local milk/egg provider? That would be even more amazing! This is fantastic. Chef Andy has been such an amazing leader for our school nutrition program. My pizza loving boy and all his friends will be excited to eat this! Chef Andy is the best!! SO many excellent lunch choices at Mt. Blue!